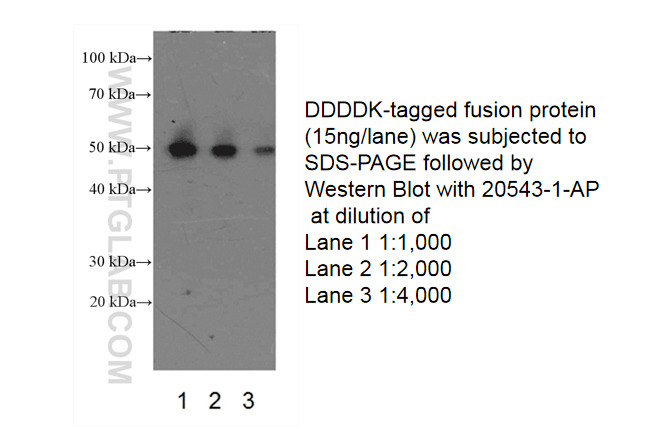 Western blot of DDDDK-tagged fusion protein with 20543-1-AP(DDDDK tag antibody) at various dilutions. Protein tags are protein or peptide sequences located either on the C- or N- terminal of the target protein, which facilitates one or several of the following characteristics: solubility, detection, purification, localization and expression. The DYKDDDDK(FLAG) peptide has been used extensively as a general tag in expression vectors. This peptide can be expressed and detected with the protein of interest as an amino-terminal or carboxy-terminal fusion. N-terminal DDDDK vectors provide an Ek cleavage site for removal of the fusion tag. The DDDDK peptide is likely to be located on the surface of a fusion protein because of its hydrophilic nature. As a result, the DDDDK peptide is more likely to be accessible to antibodies. A DDDDK-tag can be used in many different assays that require recognition by an antibody, such as western blotting, immunocytochemistry, immunoprecipitation, flow cytometry, protein purification, and in the study of protein-protein interactions, cell ultrastructure, and protein localization and so on. This antibody is a rabbit polyclonal antibody raised against 3xFlag (3xDYKDDDDKT) sequence and recognizes the (1x) and (3x)DYKDDDDK peptide and detects DDDDK-tagged proteins. Anti-FLAG is a registered trademark of Sigma-Aldrich Biotechnology. Centlein maintains centrosome cohesion by bridging an interaction between C-Nap1 and Cep68. Sarco(endo)plasmic reticulum ATPase (SERCA) is a molecular partner of Wolfram syndrome 1 (WFS1) protein, which negatively regulates its expression. OSBP-related protein 11 (ORP11) dimerizes with ORP9 and localizes at the Golgi-late endosome interface. Increased leaf angle1, a Raf-like MAPKKK that interacts with a nuclear protein family, regulates mechanical tissue formation in the Lamina joint of rice. STAT3 Regulates Vascular Smooth Muscle Cell Phenotypic Switch by Interaction with Myocardin.